Whether it truly is pure nursing school curriculum or just something you wished before working in your nursing career… let us take some time to talk about the topics that are not traditionally covered in any type of nursing education. According to Merriam-Webster’s online dictionary, a mentor is someone who teaches or gives help or advice. While nurses are oriented to their new nursing roles, are they all mentored? According to the nurses who are out there working in the nursing profession and active on social media- new graduate nurses are not properly mentored. In addition to receiving mentorship from a more experienced nurse, the mentor who is actually doing the role-modeling can benefit from learning how to do this in a professional and productive way. So it may be a good idea to start up a course in nursing school about mentorship, if there is not currently one already. This is a good one. And while good, it is also a bit controversial. Some people do not see healthcare as a service industry. These people view it as a prestigious career that is backed by scientific evidence and nursing literature. While I do agree, there is also some amount of service provided in the healthcare environment. And- even if we do not agree- with recent healthcare reform and reimbursement policy, this is not going away. I recently interviewed an awesome nurse leader from the west coast on the Your Next Shift podcast (interview to be released in late October). He actually talked a lot about the fact that his time working in his mother’s restaurant growing up, taught him a great deal about being a nurse! Here is a good one… straight from a social media response: “Finding your Zen when the patient room looks like a slasher movie”. I loved this. Think about it. You get back to your patient’s room. And it looks NOTHING like the way you left it! Oh my!?!?! What the heck could have happened here? Well, you can get mad- which is often not a very helpful response. Or you can take a deep breath, let it go, and laugh about the scene that you walked into. I think this tip is about more than the patient’s room. It is about being flexible. Realizing that there will be good times and bad in nursing. Doing your best to view every situation in a positive light. Maintaining balance and doing your best to stay calm in the chaos that nursing can be! Student loan repayment. This topic can be certainly overwhelming. And one, that I can recall, was definitely NOT covered in nursing school. Then after nursing school, for my masters’ degrees- I was blessed to have my place of employment reimburse me for my bills. So while I do not have a ton of experience with nursing student loan repayment, I am pleased to share that one of my nurse bloggers colleagues does! (Yay for this.) 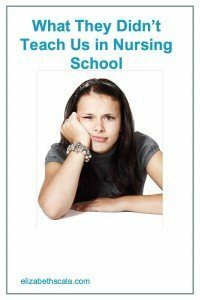 Check out this post on Scrub-Ed that goes over financial aid options and how to pay for nursing school. Nursing school failed to tell most of us that nursing is a 24/7 operation. There will always be another shift coming in. Or another nurse taking over, when we go home. In the case of those nursing careers outside of the hospital- there are often on call pagers, support hotlines that patients can access, or systems set up so that you can unplug from time-to-time. Even as a nurse who is also a business owner, I have to practice what I preach here and put away my cell phone. Turn off my laptop. And avoid checking email for the length of one weekend’s time. Sure, you have to be responsible as a nurse. You also have to be accountable! For your own actions and for the fact that you do not have to do it alone. Nursing is not a profession where you will be completely alone. Be accountable for your work and then when you are not at work… let it go and allow someone else to be accountable for theirs! What else? What did you think when you got into your nursing career? 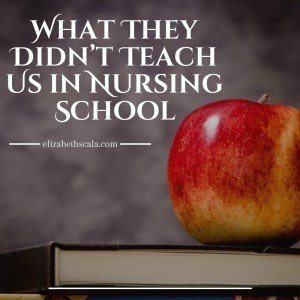 What course was left out of your nursing education? Share below and thanks for reading! End of life care…. Not tested on NCLEX yet almost every nurse looses a patient. Some are lost via crisis and others gracefully. End of life care is so important!! Good point, Donna. Thank you for sharing this to the discussion! This is very true…when I started out as an RN in a LTC setting, I’ve never even seen a deceased person before (well at wakes but you know what I mean). After experiencing my 1st death on the unit where I was the charge, I can’t describe the emotions I felt and wasn’t even sure how I felt. My supervisor told me to take some time, leave and decompress from my first passing, but I said I was fine — and then helped the NA’s prep for the morgue. The whole experience was so strange. I don’t know if nursing school will ever be able to totally prepare anyone to encounter death, paying vigil towards end of life, we just go along, make them as pain free as possible, render the best care we can — and when they have no family, we will not let them die alone. My previous NM would always make someone a one to one when it was almost their time….ensuring that everyone person we take care of in transitioning into death was never alone. I completely agree. I do not think you can learn about death from a book. Sometimes in life, we just need to experience something to learn more about it. How we react to it, how we cope with it, how we process it, and even.. as nurses- how we help it along. Thank you for sharing your experiences with such honesty. I appreciate it.. as I am sure the other readers do as well. Besides “mentor” I feel communication and management skills were not taught. Both are a must in nursing. Realizing that there are many nursing roles. From Med surge, OR, ICU, ER, etc. All of our roles are rewarding but challenging. Never assume that another role is easier and can be done by just any nurse. All take training to really know the speciality. Be kind and supportive for your fellow nurses. Don’t fuss at that OR Nurse because they didn’t get the gown snapped. You never know what they just had to go through to get the patient to your care. You are SO right about this! As nurses, sometimes we practice in our silo… forgetting that there is a whole other world out there with many nursing specialties. Then, when it comes time to interact- like needing something from another department or transferring a patient to another area- we get snippy when our needs are not immediately met. Thank you for pointing this out and reminding us that we need that bigger vision in nursing! Great points, Eileen. Appreciate you adding these to the list! I think there should be a financial course in nursing school to educate nurses about the financial aspects of the health care industry. When I first became a Nurse Case Manager, I realized the importance of Utilization Management and efficiency of care while maintaining the safety and quality of care to satisfy our customers. I agree, Meseret. I actually started teaching some business skills that I have learned as a nurse business owner to nurses that work in traditional nursing. We need to know not only have to take care of patients, but to manage more of the business aspects of healthcare too. Great point! Time management skills. i suppose they were a given because everything was supposed to be accomplished by certain deadlines. However, introduction to calendaring, prioritizing ad things I have learned, painfully, over 40+ years in nursing could have been covered in one course. Calendaring! I love it. That is such an important piece, Kathleen. And the fact that we need to prioritize. We cannot be everything (and everywhere) to everybody. So we need to learn who (and when) to say ‘yes’ to. And then also be comfortable saying ‘no’ from time-to-time. Thanks for the comment! Culture /diversity training. Nurses need to learn how to care for patients and their families through a global lens. We need to learn how to speak and communicate in the same language in order to promote and achieve higher quality of outcomes. That is SO needed these days. As technology, social media, and other updates make this globe a little bit smaller… we need to realize that we are going to care for patients from all walks of life. Great point, Michelle. Thank you! They don’t teach us how to handle a “slow code”. I’m old school and ACLS certified. If the patient is not a DNR, I fell obliged to attempt to revive the person. However, reality is quite different. Also, it puts our license and practice at risk. There are many gray areas like this in nursing I was not prepared for thirty-five years ago when I stepped out in a white dress and cap on my own. Wow, Patti. I never heard of nor thought of this before. This is a wonderful addition to this list. Thank you for sharing! How to manage lateral violence in a career that eats their young. Great article Elizabeth. I think there is so much left out of the nursing school curriculum. Schools teach for the test and the how to be a nurse but they don’t teach you about the critical thinking, legal aspects and emotional literacy of how to deal with your emotions. Many of us shut down and develop a wall around us which does not serve us. Wonderful additions, Lorie. Appreciate you bringing the legal content and emotional issues to the table. Interpersonal Communication – listening skills. While there’s hardly time to practice good listening in modern medicine, it may be the most important – sometimes the only – patient-centered care we can provide. If the financial future of health care is tied to patient satisfaction, eye-level, eye-contact, engaged listening is a skill every provider needs to master. Great points, John! Thank you for sharing your comment with us. John, that is indeed a skill that needs taught. We were introduced to listening skills during patient care, but never as a separate topic. All of these our great suggestions and agree with them all. I would say my top three would be the importance of self-care and how to make time for it it while works. 2. How to deal with challenging co-workers or at least how to communicate effectively 3. The outside of the box opportunities as a nurse such as nurse entrepreneur, nurse coach, legal nurse, etc. These are all wonderful suggestions. Perhaps holism and holistic care are taught in some or most schools, but it wasn’t when I was in school. Elizabeth, I’m interested to hear how many of your readers had holistic nursing as part of their program. I taught a class in one program as an elective and the interest was huge. The self care segments were especially appreciated. At minimum, clarity about holistic care is really important- what it is and what it isn’t. That’s so true, Carmen. Some programs have it and others do not. I think that those holistic topics would be a great addition!